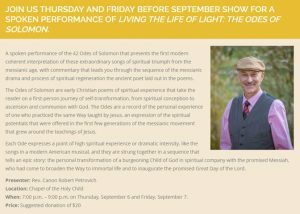 When: 7:00 p.m. – 9:00 p.m. on Thursday, September 6 and Friday, September 7. A spoken performance of the 42 Odes of Solomon that presents the first modern coherent interpretation of these extraordinary songs of spiritual triumph from the messianic age, with commentary that leads you through the sequence of the messianic drama and process of spiritual regeneration the ancient poet laid out in the poems. The premiere performance of this new translation of the Odes, the most recent publication of the Jamilian University Press. The book Living the Life of Light: A Drama of Ascension will be available for sale and signing by the author.